SINGAPORE – Cooler Master, a leader in PC cooling solutions, releases both the 120mm and 140mm Addressable RGB (ARGB) case fans. Users can now upgrade their case and liquid coolers with the new yet affordable ARGB case fans where each fan has eight adjustable RGB LEDs. The 3-in-1 pack version comes with a RGB controller that can cycle through 10 presets. ARGB is a new way of lighting. The input uses a 3-pin connection instead of the standard 4-pin RGB. Do check with the motherboard provider for compatible motherboards. The MasterFan MF120R & MF140R ARGB series gives user the option to great a visual experience. Using the MasterPlus+ software, users can do custom lighting all of our intuitive software. Create a custom lighting show using our Light Maker feature, or, individually light eight LEDs. The choice and freedom are up to the user. Fully built and designed by Cooler Master, the MasterFan MF120R & MF140R ARGB is equipped with sound absorbing rubber pads for silent operation. The fan blade design is inspired by the combination of Jet Engine and Helicopter design for good static pressure without sacrificing the Air Flow. There are two ways to light up these fans. Through an ARGB compatible motherboard, or, with the RGB controller. Users can change the preset, speed, and use MasterPlus+ to do more customization. The choice and freedom are up to the user. Cooler Master gives users the tools to make our products, theirs. 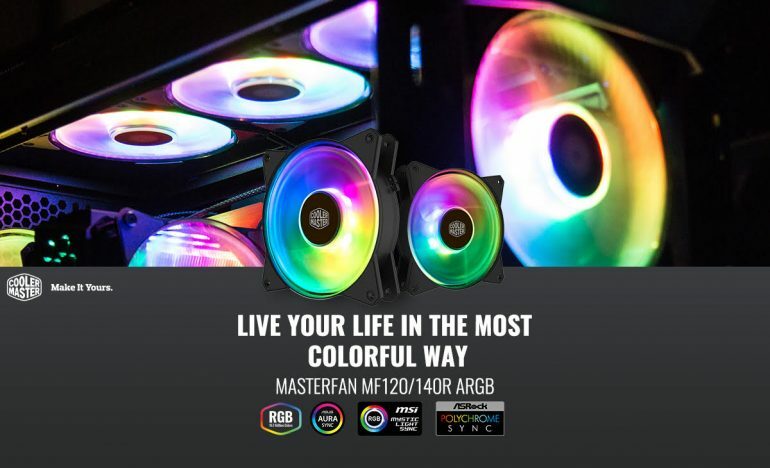 The MasterFan MF120R & MF140R ARGB is now available in Singapore.